Adore Beauty - There’s Such Thing As A Clear Lip Liner Now. Wait…What? Yes, I had the exact same questions as you. Isn’t the point of a lip liner to create a visible border around the lips? What on earth does a clear lip liner even do? Are you meant to apply a coloured lip liner too? The list goes on. The good news is that I’ve found the answers to our questions, and it turns out a clear lip liner isn’t as pointless as I first thought. What Does A Clear Lip Liner Do? Okay, so Dr. Hauschka’s Lip Line Definer is invisible, but it has a purpose – I promise. It’s perfect for those who want to prevent smudging, feathering or lipstick settling into fine lines around the lips. If your current lip balm isn't irritating your skin, you shouldn't feel like you have to toss it. But if you find that your lips never seem to stay hydrated, you might want to look for a balm that contains nourishing ingredients like lanolin or simple beeswax without perfumes or dyes, says Dr. Nazarian. Wheatgerm oil, almond oil, jojoba oil, coconut oil, sunflower oil, cottonseed oil, aloe vera, and shea butter are all ingredients that Dr. Jaliman loves. One of her favorite treatments is Dr. Hauschka Lip Balm because it contains nourishing oils (like calendula oil) and cocoa butter to revive a cracked pout. "It also has calming and anti-inflammatory properties which can help soothe very dry, chapped lips," she says. Apparently, men love toners. This one works to minimise the appearance of pores, balances moisture and oil content in your skin, and leaves a super-radiant finish. It uses anthyllis and witch hazel to support tone and elasticity. "I love the simple, refreshing hydration from Dr. Hauschka's spray," says Sean. Dr. Hauschka creates make-up for Juliette Binoche at the Berlin International Film Festival 2019. 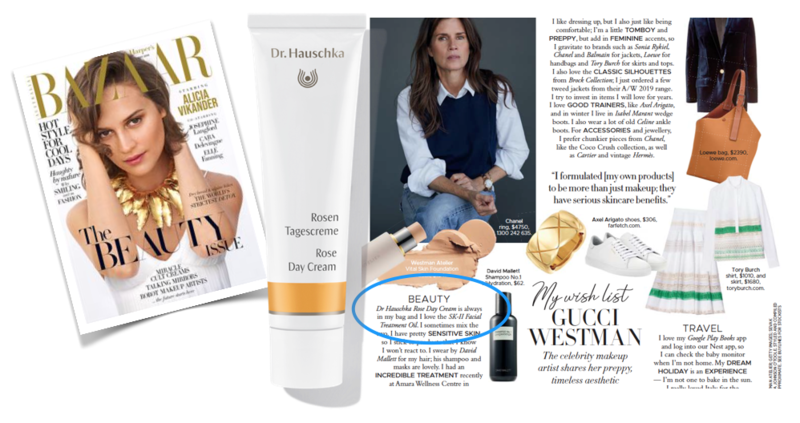 French actress Juliette Binoche, this year’s jury president of Berlin International Film Festival, has chosen the 100% certified natural cosmetic brand Dr. Hauschka for her red carpet looks throughout the whole festival days 2019.
Who hasn’t heard of these natural beauty pioneers? Another German export, Dr. Hauschka beauty products were first launched in 1967 as an extension to their original medicine range and now consist of an extensive range of certified natural skin care and colour cosmetics. Based on the powerful natural rhythmic alternation of darkness and light, warmth and cold, movement and rest, Dr. Hauschka products are certified by NATRUE, based on sustainable and biodynamic practices and not tested on animals. Hero products include The Firming Mask with combine rose water, petal extract, wax and essential oil to support your skin’s elasticity and diminish the appearance of fine lines and the Rose Day Cream, which smells as heavenly as the rest of this biodynamic range. Best for – organic nourishment. You always look so put together yet effortless, what products are always in your beauty bag? US model Christie Brinkley doesn't look anything like her 64 years. She is open about having had work done, but only a few minor tweaks to enhance her look. Her makeup is always flattering and she religiously takes care of her skin. One product she loves is Dr. Hauschka's Intensive Treatment for Menopausal Skin from Wholehealth Pharmacy and Healthfoods Maroochydore. KMR Beaute - Look, Think & Feel Better. On top of my personal passion for cosmetic product formulations, I am privy to some insider info via the marketing calendars from business partners at my place of work and revitalisation #GaslightBeauty. I have total respect for launch dates and today is such for Dr. Hauschka Australia and their two-phase premium quality, certified natural, Eye Makeup Remover. It is a BIG deal because there aren't that many natural products that can remove waterproof mascara (although I suggest avoiding waterproof mascara as there is not a lot that is 'natural' with this formula. For your eye's sake) without leaving a greasy residue or worse still, having to use it a couple of times to remove it which pulls on the delicate skin around your eyes. Don't get me wrong, a few out there are amazing, a few, more options are better, this is better, much better. I got a sample, big deal? Yes it is when a little is all that you need to see it work. Besides the (see the photo in my comments below) 1 litre bottle that I have at work...! Just kidding, but I hope you like my disPLAY.